A soldier stands in full gear at the NE library exhibit A Soldier’s Load. 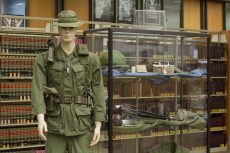 The display features items that soldiers carried into the Vietnam War and things they carried back once the war was over. The exhibit will run until Nov. 18. A Soldier’s Load exhibit is on display in the NE library as a part of the National Endowment for the Arts’ Big Read program. The exhibit is located on the main floor by the front desk and will be on display until Nov. 18. The display contains Vietnam War artifacts, including weaponry and military supplies. Books about the Vietnam War and post-traumatic stress disorder are also on display and available for checkout. 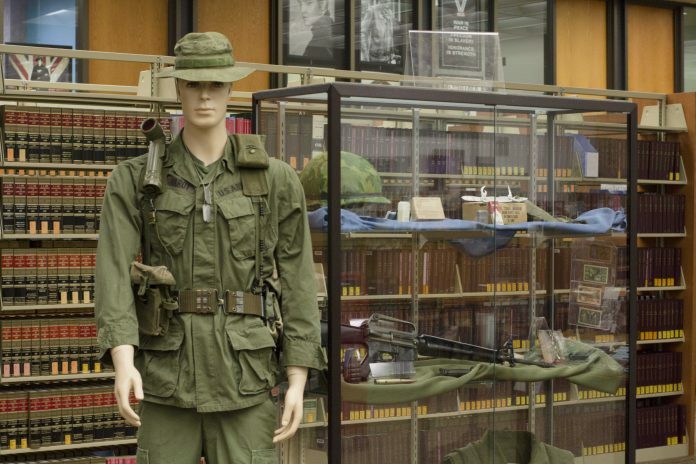 All items in the exhibit were donated from the National Vietnam War Museum in Weatherford. A panel discussion about the novel The Things They Carried by Tim O’Brien will be held at 12:30 p.m. Oct. 20 on the main floor in the NE library. The panel will consist of history and English professors.